Built 1916 by Swan, Hunter and Wigham Richardson Ltd. The Lord Kelvin was built in 1916 for the Anglo American Telegraph Company, which at that time had leased all its cables to Western Union. 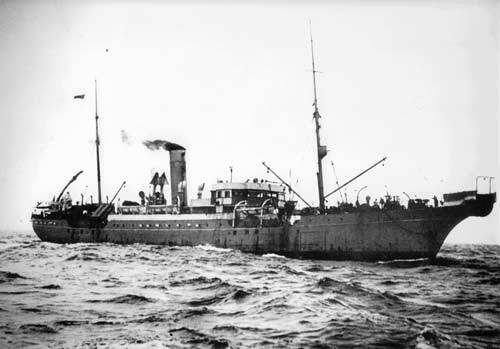 The ship was used for cable repair duties, based at Halifax, Nova Scotia, and also laid the first Permalloy loaded cable, the worlds first submerged telegraph repeater (inserted in the 1881 Atlantic cable in 1950), and the first flexible telephone repeaters (between Key West and Havana in 1950). She was later transferred to Transatlantic Cables Bermuda Ltd., and in 1966 was sold for scrap. During World War II the Lord Kelvin was in a number of convoys around the east coast of Canada and across the Atlantic, details of which may be seen at ConvoyWeb. This nicely mounted photograph of the Lord Kelvin belonged to the late Captain Ralph P. Fuller, who sailed on the ship near the beginning of his long career at sea. 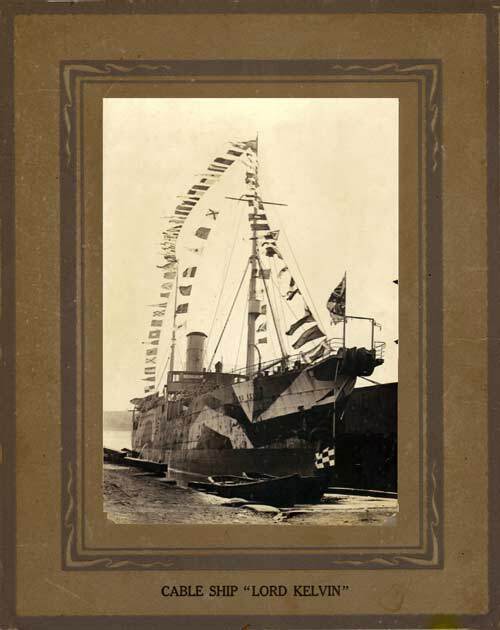 He went to sea as a boy of 15; by 1917 he was 2nd officer on the Lamport Holt merchant ship SS Memling. 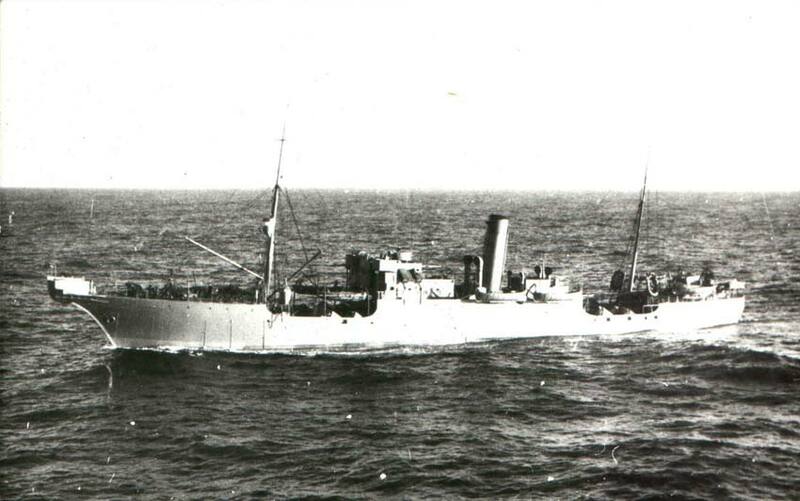 In October of that year the Memling was torpedoed off Brest, France, and was declared a total loss after managing to make port . 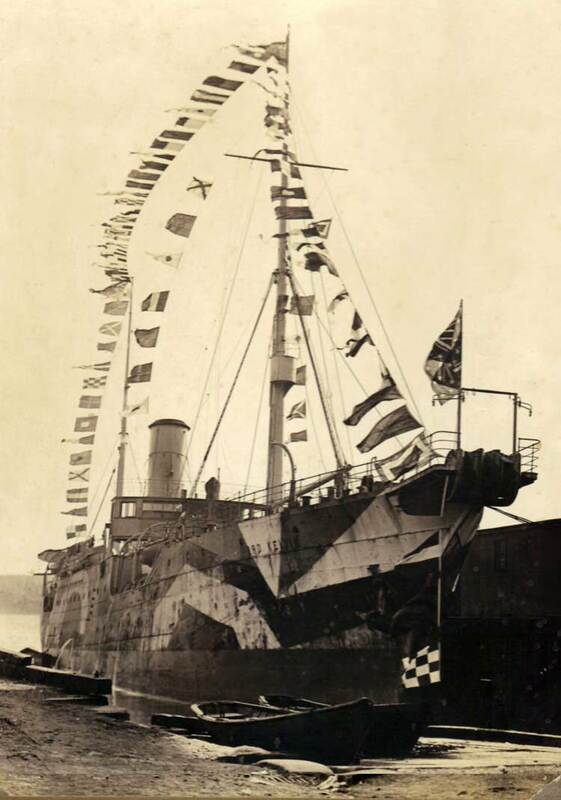 Captain Fuller's grandson, George Fuller, who kindly provided the photograph and information above, would be interested to receive any information on his grandfather's service on the Lord Kelvin. From the records of his career, this would have been from approximately late 1917 until no later than his marriage in 1919. Mr Fuller may be contacted via the Atlantic Cable website. Bill Glover adds this note: I would say this photo was taken at the end of World War I and the flags celebrate this. The Naval expression for this type of display is ‘Dressed Overall.’ The ship is in WW I camouflage, the first I've ever seen so painted, and is in drydock—most likely for a complete overhaul after war service. 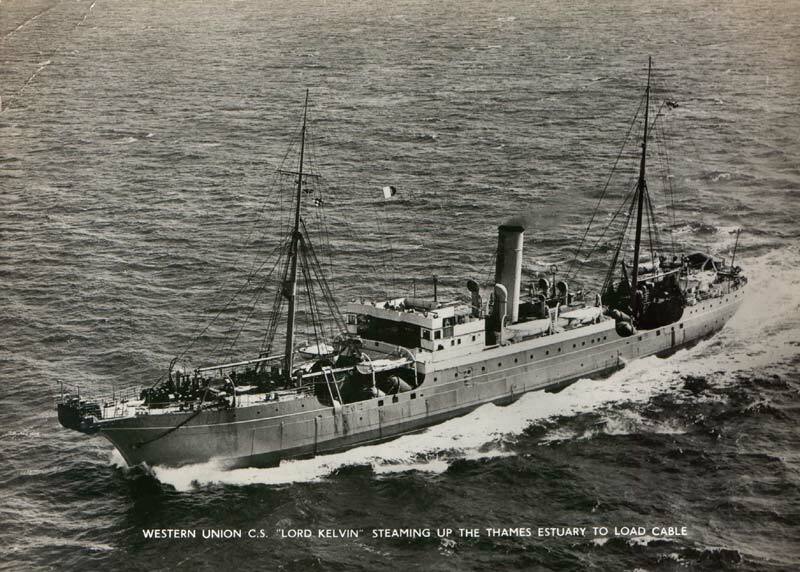 Western Union CS Lord Kelvin steaming up the Thames Estuary to load cable. 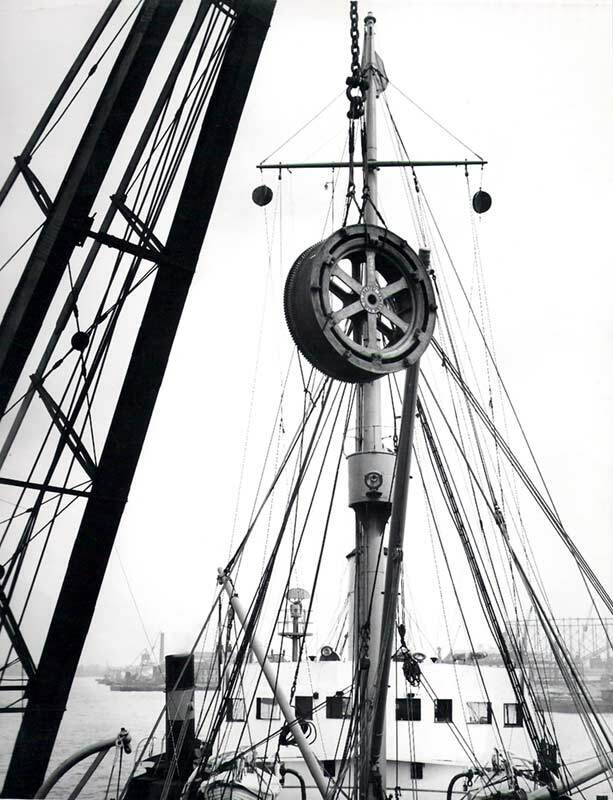 In 1953 the Lord Kelvin underwent an extensive refit of the cable machinery at the Telegraph Construction and Maintenance Company, Greenwich, and the work was documented in an article in the Telcon magazine, reproduced below. the double helical gearing had been replaced. [Bert Rivers, fourth from right, heavy gang supervisor. By A.D. Lidderdale, A.I.Mech.E., M.I.Prod.E. An interesting example arose recently of the close cooperation between the Company and its customers. In the middle of last year The Western Union Telegraph Company advised us that the helical drive gears of the picking-up and paying-out machinery of their cable ship "Lord Kelvin" was showing signs of wear after many years of regular use. 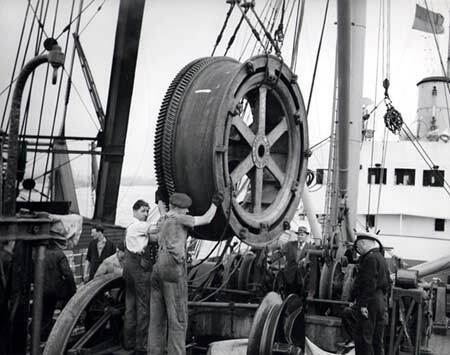 The "Lord Kelvin" has been mainly engaged on cable repair work in the North Atlantic, arduous duty involving frequent use of the picking-up and paying-out gear. It was not surprising to us therefore that the main drive gears were showing signs of wear. Replacement gears were immediately put in hand and, as their completion came nearer, arrangements were made with Western Union for the changeover to be effected during the visit of the "Lord Kelvin" to our works at Greenwich in May of this year for loading cable. 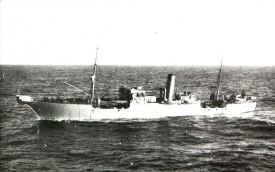 Because of weather conditions in the North Atlantic, the cable ships of The Western Union Telegraph Company have a very heavy programme during the Spring, Summer and Autumn months and it was, therefore, of the greatest importance to Western Union that the use of the cable ship should not be denied to them whilst repairs were being carried out. 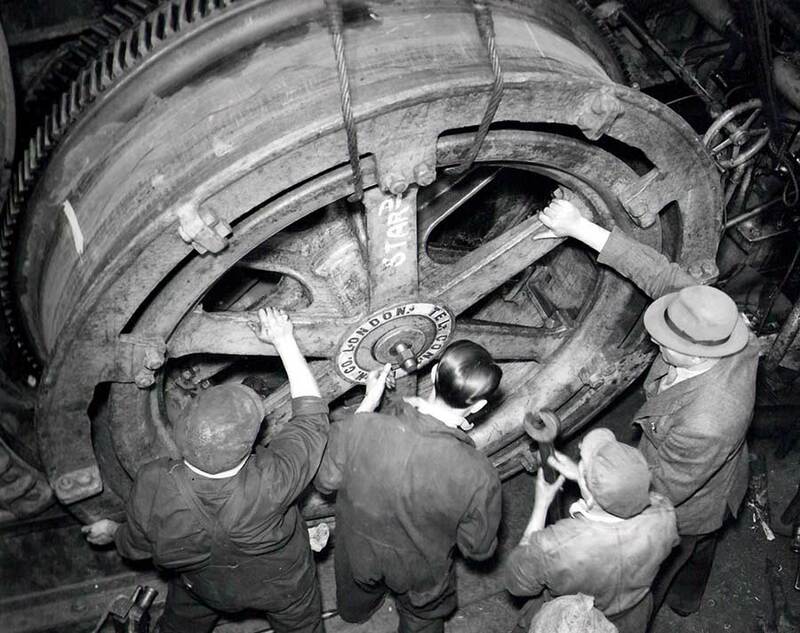 Likewise, it was equally essential, in view of the heavy programme, that replacement gears should be fitted at the earliest possible date. We were, therefore, extremely happy to be able to offer to carry out the repair work and complete it during the period in which the cable was being loaded. 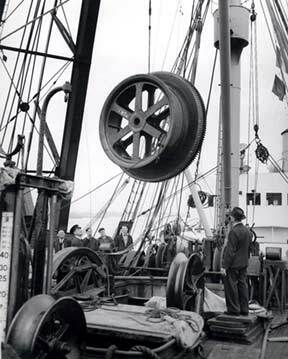 The repair work involved the removal of the drums from the picking-up and paying-out gear, bringing them ashore, removing in our Engineers Shop the helical gear from the drums, machining the replacement helical gears to suit and refitting these to the drums, after which the latter had to be returned to the ship and re-installed. 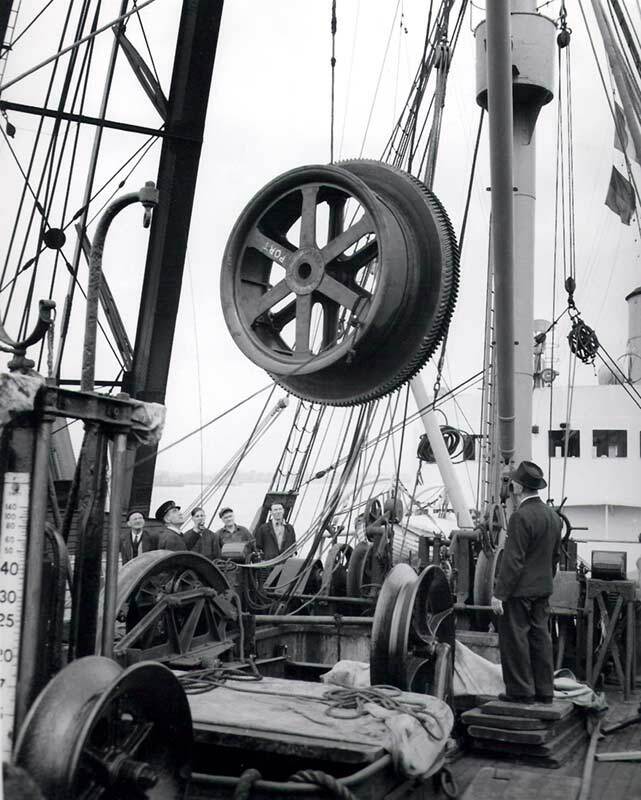 As the drums weighed 2 tons 15 cwt and 4 tons each, the magnitude of this task will be readily understood and the smoothness with which the whole work was carried through is greatly to the credit of our own Engineering Division. 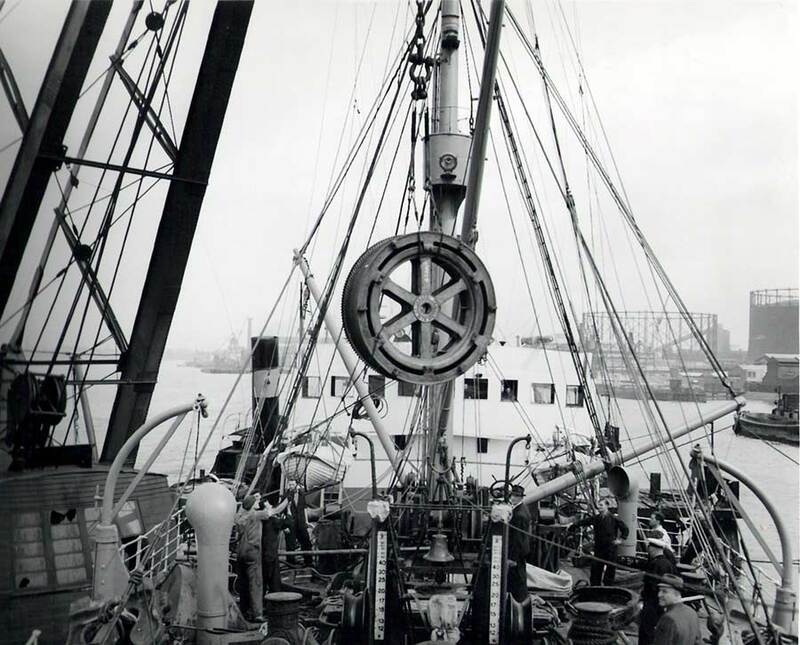 At the same time the assistance received from the Ship's Engineers and also from the Port of London Authority, who undertook the heavy lifting for us, must be given full recognition. Whilst the drums were in our Engineers Shop, the opportunity was taken of drawing the helical pinions from their shafts and fitting replacements. 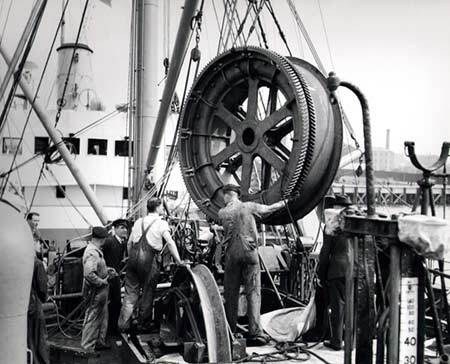 At the same time new bearings were supplied and repairs carried out to the brake gear. All the above work was carried out and the cable picking-up and paying-out gear re-assembled and tested and handed over to the ship's engineers within the time taken to load the consignment of cable for which the "Lord Kelvin" had come to Greenwich. In this way, the ship's owners were able to have the cable machinery overhauled without the loss of the use of the ship for a single day. All those who worked so hard to make a success of the repair work will be pleased to know that the following letter of thanks was received from The Western Union Telegraph Company as a tribute to the success of their efforts and that we have since received advice from them that the repair work has proved entirely successful. "I take this opportunity for putting on record the thanks and appreciation I have already expressed to you verbally for the excellent work which you and your staff did on the gear replacements. 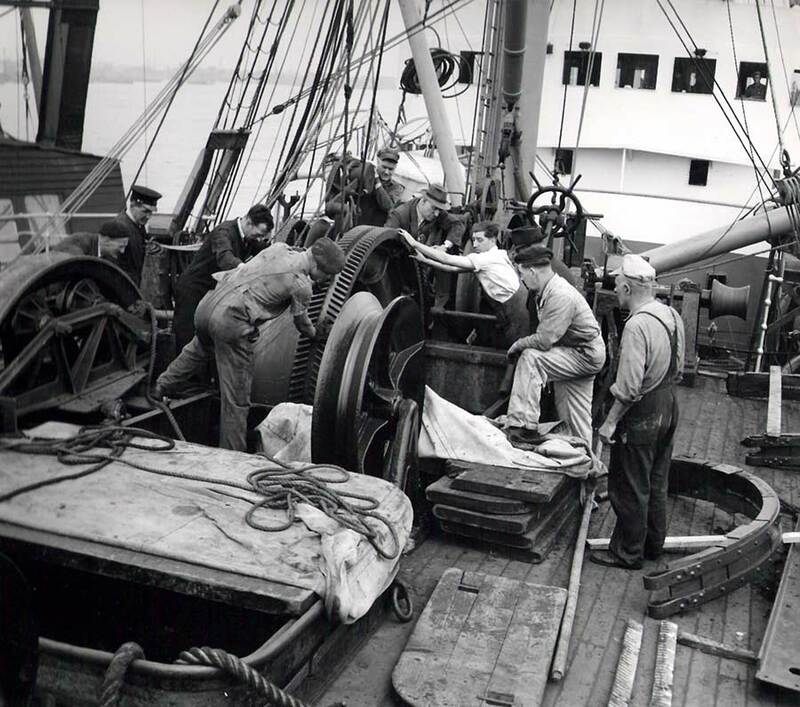 There were many details which might have gone awry with serious consequences to the whole of the summer programme for the ship's cable work, and the fact that the new gears went in successfully and right on schedule was very gratifying. sgd. R.A. Goodman, European Plant Engineer." Bert Rivers, second from the right. Taking an outsize spanner to an outsize nut. Thanks to Jim Jones for supplying the photographs and text for this article.